The path begins and continues with meditation. Students are introduced to Buddhist and Shambhala teachings in the context of an ongoing meditation practice. Shambhala Meditation Centres around the world offer a broad and carefully thought-out range of classes, meditation programs and community activities. At our residential practice and retreat centres, students can deepen their meditation through longer programs, and engage in periods of intensive study. The path consists of a series of classes and retreats designed to stabilize and strengthen our meditation practice, and to clarify our understanding of the teachings. These courses offer entry into the wisdom tradition of Shambhala as well as the classical teachings of Tibetan Buddhism. A careful sequence of group practice programs at residential centres ensure the unfolding of deeper training, including week-long meditation retreats as well as specific Assemblies that introduce more advanced practices. Mindfulness practice is playing an increasingly prominent role in contemporary society as interest in this approach to life continues to grow. 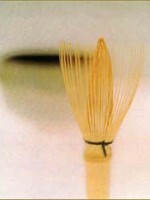 A unique quality of the meditation teachings is that they can be expressed through existing cultural norms, making use of them rather than replacing them. This allows many modern people to practice meditation today without renouncing our cultural heritage or radically changing our lifestyles. The path places strong emphasis on joining the view and practice of meditation with everyday life, rather than the more traditional monastic approach (though we also have a Shambhala monastic order). The Shambhala path has been carefully designed so that we can immerse ourselves in all courses and retreats—even the deeper trainings—while still sustaining a family, career, and service in the world. 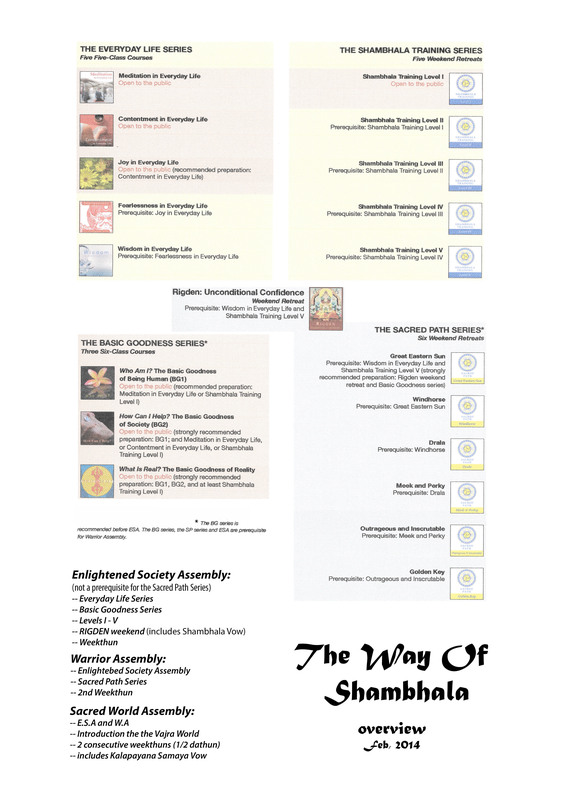 Way of Shambhala is a complete introduction to the foundations of Shambhala Buddhism. This series of weekend contemplative workshops and weeknight classes provides an experiential overview of meditation practice, wisdom teachings, contemplative arts, and physical disciplines rooted in the ancient traditions of Shambhala and Tibetan Buddhism. This program is open to everyone and also prepares students who wish to further develop their practice and study at Enlightened Society Assembly and Warrior Assembly. Click on the image at right to see a larger version of the detailed description, or visit this page. The Shambhala Training Heart of Warriorship program (Levels I-V) introduces teachings on “warriorship” that cultivate genuineness, confidence, humour, and dignity in daily life. When taken as a component of the integrated Way of Shambhala curriculum, this course of study prepares students who wish to develop their practice and study further for Enlightened Society Assembly and the Shambhala Sacred Path program. Shambhala Training Levels I-V, or The Heart of Warriorship, may also be practiced as a series of independent workshops. Inspired by Nalanda, an eleventh-century Indian university that welcomed teachings and disciplines from many different traditions, a number of arts, disciplines and activities have developed within Shambhala. The arts and other contemplative disciplines, including flower arranging, photography, tea ceremony, and kyudo, are a vehicle for integrating mindfulness and awareness into everyday life. Each represents a genuine contemplative path that further enriches our day-to-day experience. After beginning meditation practice, many want to deepen this experience through deeper retreats. A week of meditation, known as weekthün (week session), is offered in some local centres and in all of our rural retreat centres. It is a powerful introduction and deepening of mindfulness-awareness meditation, open to anyone. The program includes sitting and walking meditation. Dathün (Tibetan for “month session”) is a one-month group meditation retreat led by a senior teacher. Silence and functional talking are observed and meals are served in the shrine room through a contemplative eating practice. The retreat includes talks, study, and a short work period. After attending a dathün, students may choose to do a solitary retreat, and a number of Shambhala practice centres have facilities for individual retreats. Enlightened Society Assembly is a group retreat for all who have completed Rigden: Unconditional Confidence. This deep training emphasizes the view of the intrinsic goodness of all beings and society, practices that rouse compassionate openness, and confident activity that engages fully in the world. In particular, this Assembly focuses on how we can create enlightened society on the spot, at home, in our city and nation, and wherever we go. Participants train in a practice to expand the warmth and strength of our hearts called the Shambhala Sadhana. This program works to integrate study, practice and community with an aim to understanding the basic goodness of oneself, others, society and the phenomenal world. There is a chance to make a personal commitment to be of benefit by taking the Enlightened Society Vow. Under the guidance of an Acharya and another senior teacher, Enlightened Society Assembly provides an opportunity to fully engage and integrate these teachings and practices while living in a Shambhala practice environment. Read about prerequisites and how to apply. The Sacred Path program introduces further warriorship practices, which extend the basic meditation training. These practices are based on societal vision and aspiration to help the world. This level of training cultivates one’s dignity and natural gifts that are able to widen one’s sphere of compassionate and practical influence. During a series of visionary experiences that took place between 1976 and 1980, Chögyam Trungpa wrote down what became known as the Shambhala texts. The Sacred Path program is a study of these texts and on the extensive commentaries he and Sakyong Mipham gave on these teachings and how to practice them in modern times. 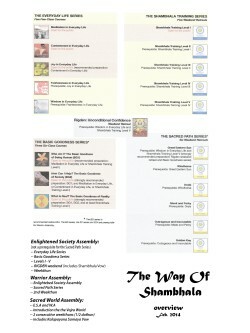 Warrior Assembly, the culmination of Shambhala Training, is a living teaching on creating enlightened society. Participants receive the transmission of advanced Shambhala practices of confidence and study the root text and commentary, The Golden Sun of the Great East. This text describes the principles and practices of Ashe, a simple and powerful practice that enables one to transform fear and hesitation into wisdom and authenticity. The Sacred World Assembly is the gateway for entering the Shambhala lineage of vajrayana Buddhist practice and study. This practice and study program builds on the understanding and meditation practice developed in retreats, Enlightened Society Assembly, and Warrior Assembly, and requires a deep personal commitment to the path and to meditation practice. At the Sacred World Assembly students will receive the traditional vajrayana transmission and begin their Shambhala ngöndro – the preliminary practices for receiving the Rigden Abhisheka. 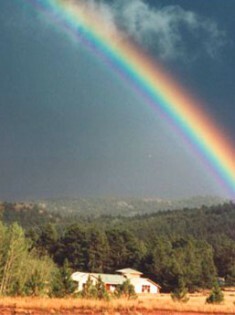 The Sacred World Assembly is a complete entrance into the sacred outlook of Shambhala. Vajrayana practice and study programs are held at both urban and residential Shambhala meditation centres to support a student’s practice with teachings, group practice and guidance from acharyas and the Sakyong.